The husband might be the president with a simple lifestyle, but First Lady Aisha Buhari sure is a baller! Who knew she is such a fashionista? 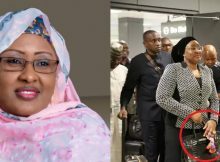 Hours after the wife of the President, Aisha Buhari, arrived Washington DC, United States, discerning eyes picked her getup apart and noticed that she was carrying a Hermès Birkin bag. A quick check pegs the price of the said bag on ebay at $105,000 (N40 million, if converted using parallel market rate). 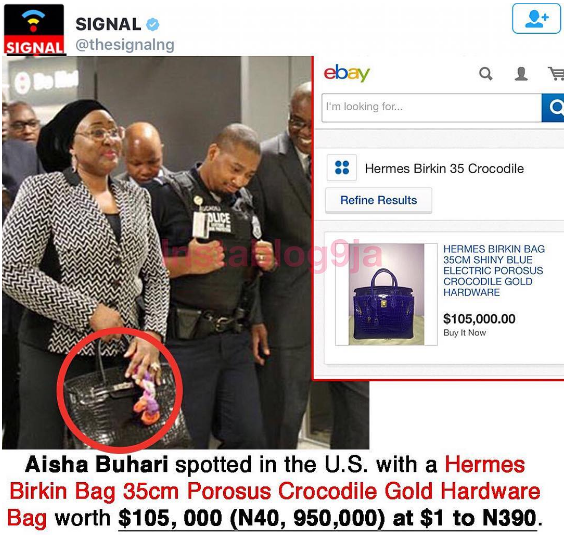 This is not the first time Mrs Buhari is being accused of plunging incredulous amounts of naira for luxury items. In June 2015, after her official portraits surfaced on social media, news broke that the wristwatch she had on in the photograph was a Cartier Baignoire wristwatch which went for £34,500 (about N10m at that time). Now, with the Hermes Birkin drama, folks are questioning the rationale behind carrying an alleged N40m bag. However, We checked out replicas of the bag. And we saw a perfect replica for just $308 USD (N120,120) at 390 naira/USD. Is Aisha’s bag the Authentic N40m version or the Fugazi N120k? Well, we don’t know for sure.